Since creating Ideas to make Mauritius better one month ago, 43 different people have submitted 145 ideas and cast 1,570 votes which is great. All young people must be taught about the economy, how to spend wisely and why it is important to save money (yes, everyone gets old after some time…) This might be done at secondary level for that matter. Mauritius Telecom should offer powerful hosting facilities (e.g. Linux, Apache, MySQL and PHP) for free. If this is done, a lot of Mauritians will choose to host their websites locally hence decreasing international traffic. Everyone benefits. People should stop thinking in terms of communities, casts and their “own”. 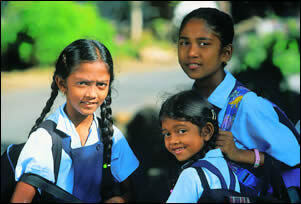 We are all just Mauritians. People ,who can afford, should be made to pay in the public health sector (Hospitals, Community and Local area health centres) so that quality of care dispensed can be improved and load on government budget decreased. Death penalty should be introduced for some extreme cases. “Extreme cases” should be decided very carefully though. Our current laws are IMHO, too kind towards rapists, molesters, murderers…. Yesterday, I was astounded to learn that Last.fm was going to charge people €3.00 per month to listen to streaming radio except those living in the US, the UK and Germany. And I thought that was Technological Racism from Last.fm. Some people argued that streaming radio is expensive and it this should be a paid service. Of course! In fact, most sane people don’t have any problems paying some money provided everyone does it. As someone said, it would have been so much better to charge everyone €1.00 instead of selecting people based on place of birth. How the PR people of Last.fm came up with such a controversial idea and thought it was a good idea defies logic. If I were you, I would have introduced some kind of quota for the radio. Say a few hours per day free, the rest (if any) being paid. This would allow people like me (who have been contributing to the Last.fm database for years now) not to feel completely abandoned. Don’t forget that last.fm is what it is because of us. One hour ago, I starting receiving Twitter messages from friends telling me to have a look at an article on the BBC News website, Last.fm to charge for streaming, and that I would be surprised. I went there and, lo and behold, my proposition was there in the article. And as a bonus, I was presented as a blogger (blog poster?) 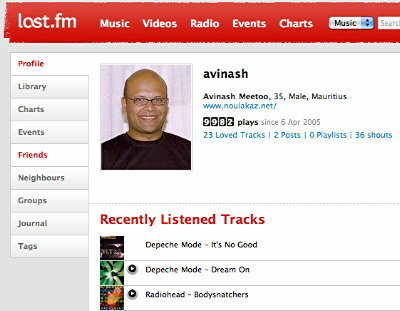 and a Last.fm-contributing musician from Mauritius! I’m sure Andy Warhol is smiling somewhere. I am having my 15 minutes of fame! Will Last.fm come to its sense? I would be extatic as I love music! 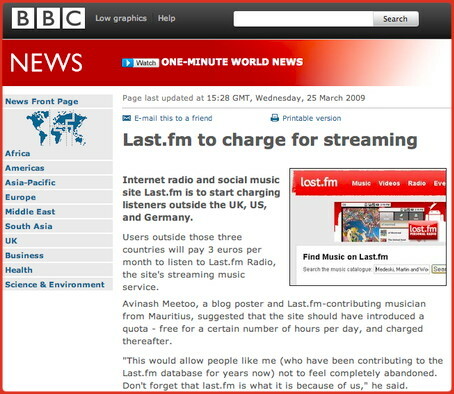 Last.fm has just announced that listening to Last.fm Radio will soon require a subscription of €3.00 per month except for those living in the US, UK and Germany who will continue to enjoy Last.fm Radio for free. I’ve been using Last.fm to scrobble my music for 4 years now and I use it a lot to discover new artists. But, today, I feel sad. Not because I’m a heavy radio listener (I can’t thanks to the infamous but totally vague fair usage policy…) but because, for the first time in my life, I feel I am a victim of (technological) racism. What’s different between someone living in Mauritius and someone living in the USA, the UK or Germany? Why one will have to pay and the other no? I live in Mauritius, a small island in the Indian Ocean, and I’ve been scrobbling since April 2005. I don’t listen to the radio frequently but sometimes it’s nice being surprised by the recommendations. It’s sad that those living in poor countries will have to fork money… or, more precisely, stop using the radio facility. I think that what you are doing is too radical and there is a risk you will lose loads and loads of traffic… and, maybe, independent artists too (like me) who would rather have their music elsewhere. Seriously, we, the ones who live in the 192 countries, want to know why we have to subsidise those will live in the USA, the UK and Germany? I have some trouble understanding your logic. As I wrote in a previous comment, it’s far more logical to make those who listen to the radio too much (depending on your own criteria) pay. Do you understand that you are asking me to pay to access a service that I use only sparingly? Someone (sil_mich) has proposed that we stop scrobbling from the 1st of April as a sign of protest. I agree 100%. We need to make the Last.fm people realise that what they are doing is creating a very dangerous precedent.